In today’s society, we are all faced with obstacles, especially those of us who are young and still learning right from wrong, and good from bad. If someone were to offer me marijuana, I would immediately decline. I am a teenager and I have already been educated on this topic. I have developed my own choices and opinions. The increasing number of youth suicides seems to be tied to two factors, bullying and marijuana. Although bullying may be a reason that youth turn to marijuana, in doesn’t resolve the underlying issues making them depressed or upset. The outcomes for trying to resolve such issues using marijuana are very poor, and in fact marijuana usually makes problems much worse. Colorado has tracked suicides before and after legalization, and policy makers should be alarmed by the results. The numbers show an increasing number of suicides by year and by age group. The youngest group (10 – 14 yo) have increased nearly 270% from 2005-08 to 2013-16. The next age group (15 – 19 years) increased by 133% over the same period. The 20-24 years group increased by 128% over the same time period. All of these jumps are very significant. 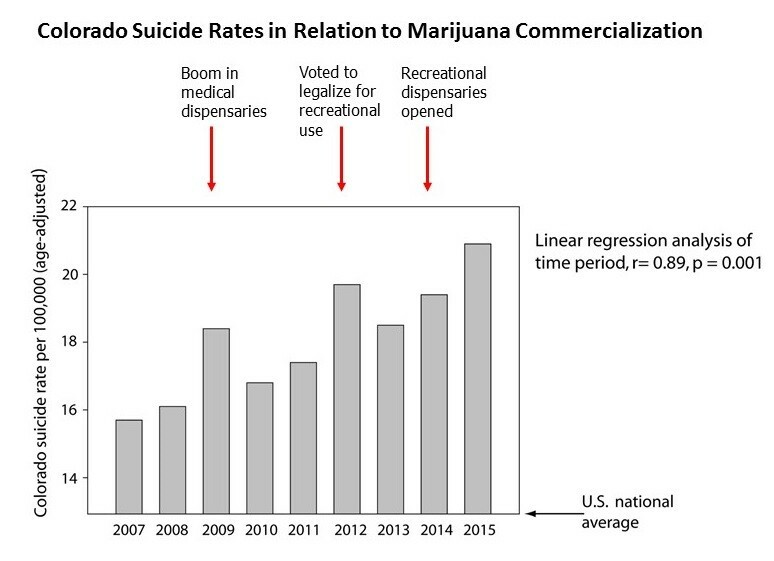 Note in the below graph that suicide rates were falling in Colorado prior to medical marijuana legalization. Then they started to rise. They fell off slightly but then skyrocketed when Colorado voters decided to green light the recreational marijuana industry. 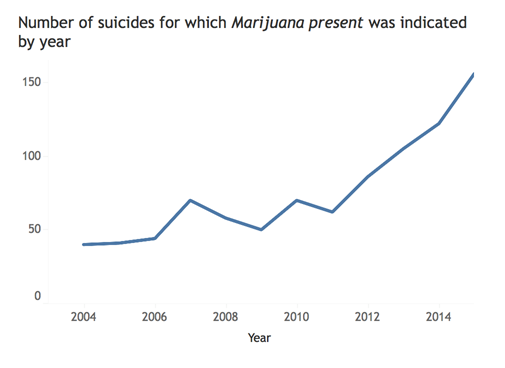 The percent of marijuana found in bodies of all suicide victims DOUBLED (from 8.1% prior to legal mj sale, 8.7% during the years of medical mj sales, TO 16% in recreational mj sales years) since recreational sales of marijuana started in 2013 from the preceding two time frames. 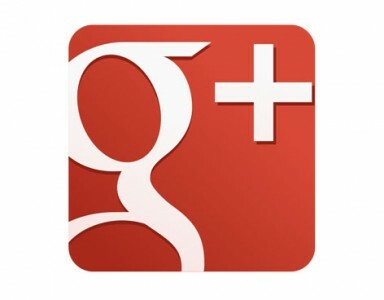 THIS should be extremely concerning…. Yet legislators are plowing ahead …. 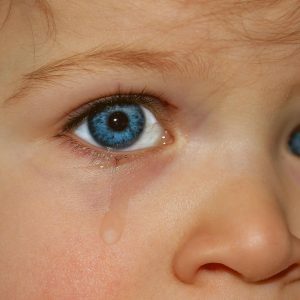 Increase in suicide for all ages seems tied to availability of the drug. 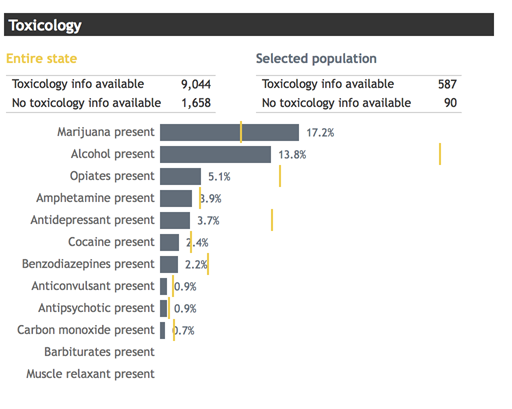 Toxicology on kids with completed suicide from Colorado 2004-2015 (no data for ’16, ’17). One scientific study shows the teens who are daily marijuana users are 7x more likely to attempt suicide than non-users. Another theory as to why marijuana is prevalent is that marijuana can decrease the vomiting reflex. If a person ingests a lethal dose of chemicals that can kill them, the body will try to expel them by vomiting. If a person takes an anti-nausea substance, it may allow those chemicals to stay in their system, therefore allowing the chemicals to kill them. Programs to prevent youth suicides need to also be concerned with preventing youth marijuana usage. 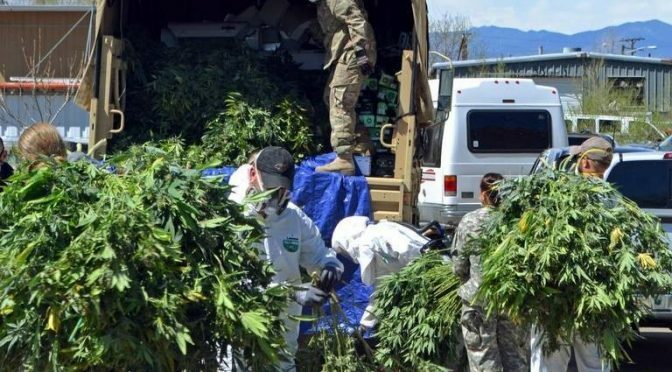 Nine out of eleven teens who committed suicide in one Colorado community had marijuana in their system. It is pathetic. To learn how one teen used marijuana to deal with bullying and then committed suicide, please listen to the following You Tube. If your child quits using marijuana, please be sure to give them counseling and support as much as possible. Since the heavy use of this drug can deplete 20% of your natural dopamine, it takes time for the brain to recover and regain the natural occurring chemicals. There’s a risk for suicide after marijuana cessation. The greatest risk comes six months after beginning abstention, according to Dr. Drew Pinsky. 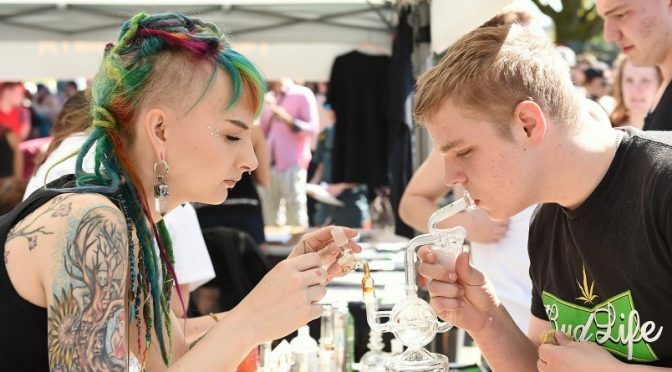 In these cases toxicology won’t show the connection with the drug, and yet, it is well known by researchers that marijuana causes mood disorders like depression which in the most serious cases lead to suicide. Learn more about suicide risk and marijuana on the MomsStrong.org website. 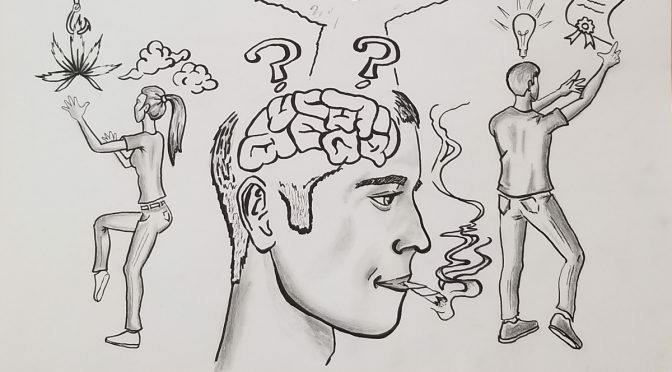 We previously wrote a three-part series on marijuana and suicide.